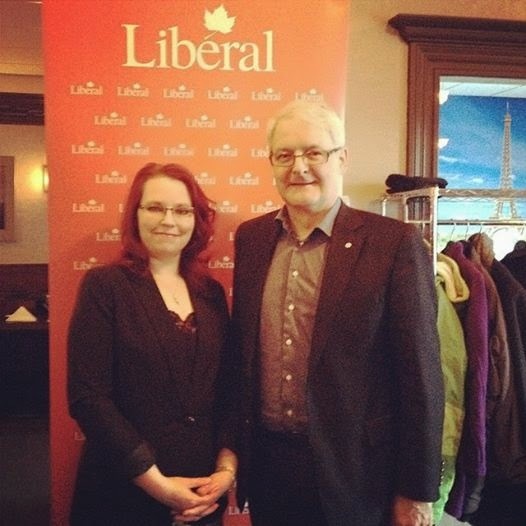 Writing this blog has led me to many opportunities and experiences, including yesterday evening when I had the chance to meet and chat with Marc Garneau. The name is likely familiar to you, as while he now serves as a Liberal MP Mr. Garneau is also well-known in Canada for his former career - as an astronaut. He was in fact the first Canadian in space, flying on the space shuttle Challenger in 1984. This is a proud accomplishment indeed, and one I remember well. I remember the sense of pride in seeing a fellow Canadian going to space, and his contributions to the space program helped cement the participation of our country in further space shuttle missions. Now Mr. Garneau serves our country in another capacity, as an MP. Last night I had the chance to meet him and speak with him about life in our community, which is of course my favourite thing to do. Someone introduced me to him after explaining a bit about what I do, and since he was not aware of this blog we started our conversation discussing it. He asked the usual questions, like if I get paid to write this (never, not even a dime), and then he asked why. Why invest the time and effort to write this blog for almost three years? Why do this for three years without pay? Where did it start and why? And so I had the opportunity to tell Marc Garneau, MP and astronaut (rocketman, if you will) about the incident that started it all, three years ago in the Vancouver airport. Every person and every adventure has a genesis story, and this is one I told at the beginning of writing this blog. It was, in fact, my first blog post. I was returning from Vancouver after a holiday with my four sisters. I had checked in and was going through security when the security guard looked at my boarding pass and asked why I was going to Fort McMurray. I replied that I was going home, and he looked at me and said: "Nobody like you lives in Fort McMurray." I was, for a moment, speechless. I retorted that people "like me" do indeed live in Fort McMurray, and raise their kids there. I was left to wonder what he meant - did he mean because I am a woman? Because I dress business casual? Because I am in my 40's? Because I look comfortable in an urban setting and no different than anyone else? Some combination of those factors? And that was where this blog began, almost three years ago. I sat in the boarding area and wavered between seething rage and complete disbelief, realizing that people on the outside had a completely erroneous concept of what this community was. I had no idea what to do, but a friend had been encouraging me to begin a blog about Fort McMurray for some time. He was convinced there was interest and that people would read it, but I doubted it. Who would read about life in Fort McMurray, I asked him? Who would even care? But after the incident with the security guard I knew that how many read it didn't matter, because I knew that I needed to write it regardless, because people "like me" needed to tell the world that we live in Fort McMurray, and about our lives here. As I told Mr. Garneau last night this blog now averages anywhere between 800-1000 views every day. My readers come from all over the planet to read about life in this community. Just a couple of weeks ago I received an email from a reader in Kuwait, and over the last three years I have connected with readers in Europe, the United States, South America and Asia. In three years this blog has had almost 500,000 views, a number which astonishes even me, because I never, ever believed anyone would read about life in Fort McMurray - but I was so very, very wrong. It was an honour and delight to share my story of life here with a true Canadian hero. We chatted about the Intrepid Junior Blogger, and I told him of her passion for science, particularly engineering, and for politics (and she is, without a doubt, becoming a hard-core Liberal even at 14). I told him that she has expressed interest in the space program (although given her inability to do more than one ride at the carnival I fear zero-g may be her nemesis), and about her desire to study overseas and then return to Canada to work and, just maybe, seek elected office to represent her fellow Canadians in some capacity. I suppose, in the end, I shared with him the story of my life here, just as I have done in this blog with you over the last three years. It was a pleasure to meet a Canadian hero, and to share my story of Fort McMurray with him - but it has been my pleasure to have done so through this blog ever since that day in the Vancouver airport, when I realized that it wasn't optional to tell my story of life here - it was essential. And so this is what I have done for the last three years with my readers, and even, on occasion, with a rocketman. Bravo! I do admire what you are doing, keep it up.